By Amanda While a Deluxe resort is not always in the budget, there are so many great benefits to staying at an EPCOT area resort they should definitely be considered. Beach Club is a favorite of mine and it’s one I often recommend to clients. Remember with discounts you can often save up to 30% off this amazing resort’s regular rates! One of the best parts about staying in any EPCOT area resort is location. Many families like to stay on the monorail line but I prefer to be a bit more centrally located. 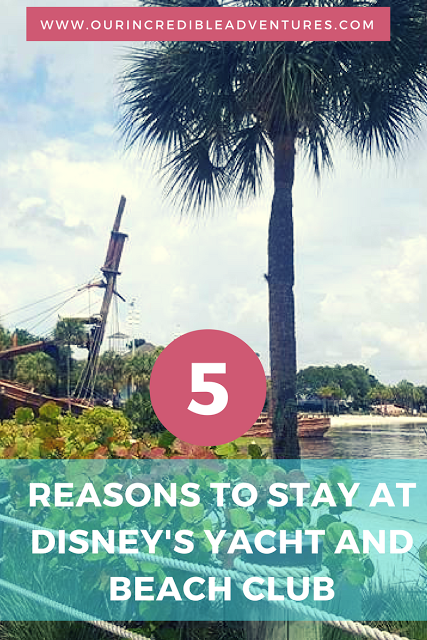 Disney’s Yacht and Beach Club are just a few minutes walk over to EPCOT, a short boat ride (or long walk) to Hollywood Studios, and just a short bus ride to Animal Kingdom and Magic Kingdom. Just keep in mind during slower times, these resorts do share buses so you may have a quick stop at Yacht Club before heading to Beach Club.